Having had a background in the arts and worked professionally as a cinematographer and lighting cameraman, astrophotography made for a natural change in focus. I had always wanted to turn my camera to the skies. A move away from London to Valencia, Spain presented me with the perfect opportunity to do just that. 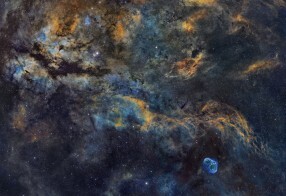 The combination of exploring deep space and the creative and technical art form that is astrophotography offered a powerful and alluring vocation. Any clear night I can be found setting up under darkening skies for a night of photography, and who knows, perhaps a new discovery. The art work you see on this site was produced using basic equipment from a modest home observatory.